SOLJIT has been helping businesses and institutions with their digital transformations since 2009. As a partner and consultant, we’ve been recommending, implementing and customizing best-in-class cloud solutions for organizations in search of growth, efficiency and scalability. Today, our expertise with Salesforce covers sales, customer service, communities and engagement, marketing, and nonprofits. To integrated ERPs and accounting to Salesforce, we use Commercient and Workato. We also use Alfresco for document management, OneSpan Sign for electronic signatures, and multiple solutions for e-commerce. 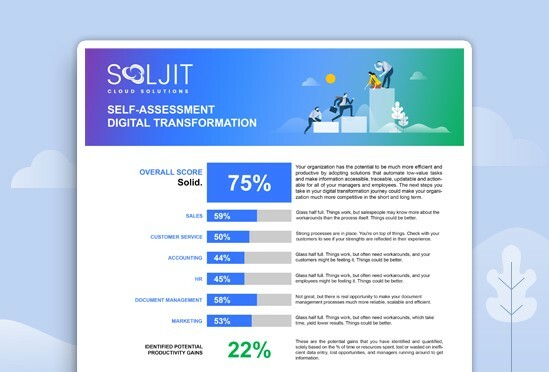 "SOLJIT is supporting us with a boutique level of service for the delivery of critical projects that enable us to automate our sales, connect to our back-office, and generate substantial savings. SOLJIT provides personalized and high-level strategic and tactical advice that result in real measurable benefits. They are definitely the best kept secret in town!" "SOLJIT's capacity to understand right from the start our business needs and guide us in making the best decisions to get the most optimized solution was key to the success of our Salesforce project. Furthermore, SOLJIT's help throughout the course of the project was really appreciated. They were always available and provided timely and satisfactory answers to our questions. I recommend working with SOLJIT." "SOLJIT is a real partner for Leucan. They are proactive, available, and really understand our needs. Thanks to their work with the Salesforce platform, we are better able to manage the relationships with our donors, which allows us to do even more for children and families that we help every day."